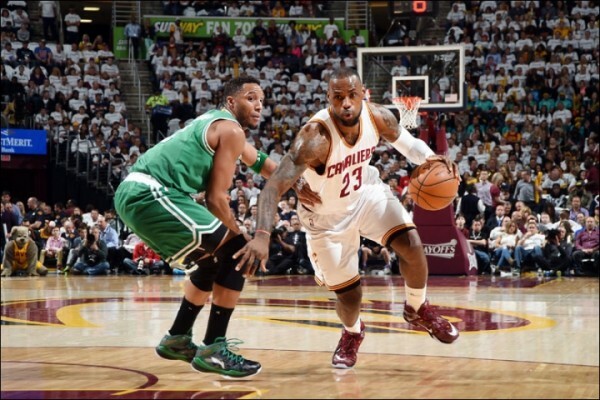 (Cleveland, OH) — Against a young and hungry Boston Celtics (0-2) team, Cleveland Cavaliers (2-0) superstar forward LeBron James came up clutch in the fourth quarter as he led his team to a 99-91 victory in Game 2. James, who finished the game with 30 points (11 of 22 from the field and seven of eight from the charity stripe), nine rebounds and seven assists, was very productive in the last 12 minutes of the game with 15 of his points coming in the final quarter. 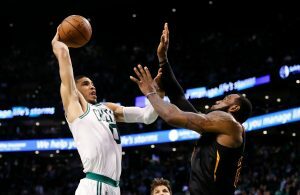 This particular game on Tuesday night at Quicken Loans Arena was, by no stretch of the imagination, a cake walk for James and his Cavs teammates, as the Celtics put up quite an inspired and gritty effort. 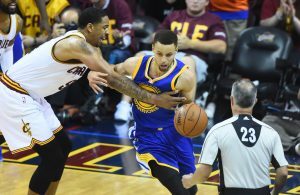 James and his fellow superstar point guard Kyrie Irving scored the Cavs’ final 26 points of the game, including all 24 of Cleveland’s points in the fourth quarter. Irving, who had a superb 30-point playoff debut in Cleveland’s 113-100 win over Boston in Game 1, followed through in Game 2 with 26 points (eight of 18 from the floor), six assists and five rebounds on the night. Kevin Love, who struggled en route to 13 points (only three of eight from the field), six rebounds and two blocked shots, had the support of his teammates after the game. Defense was very solid for the Cavs on the night, who led by as many as 13 points in the third quarter and trailed by as many as seven points in the first half. Timofey Mozgov was masterful on the defensive end, as the big man finished with 16 points, seven rebounds and a whopping five blocks, while Tristan Thompson led the team with 11 hard-fought boards off the bench. 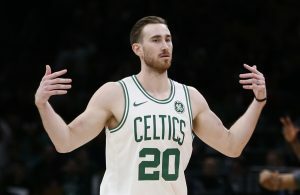 The Celtics, who refused to let the Cavs run away with a big lead, played a great game of defense as well. Celtics point guard Isaiah Thomas, who was a strong candidate for the NBA Sixth Man of the Year award this season, came off the bench to lead Boston in scoring with 22 to go along with seven assists. Forward Jared Sullinger and shooting guard Evan Turner, two former Ohio State University basketball standouts, both had solid games at the Q. Sullinger added 14 points and five rebounds off the bench, while Turner scored nine points, nabbed a game-high 12 boards, and dished out three assists. Up next, the Cavs will travel to Boston for Game 3 on Thursday at the TD Garden. The game, which is scheduled to tip off shortly after 7:00 pm ET, will be broadcast nationally on TNT.